The inaugural Evolutionary Psychology Independent Conference (EPIC) at SUNY New Paltz featured presentations by recent alumni and current students of evolutionary psychology courses, which consider the role evolutionary forces play in shaping and determining human behavior. EPIC served as a showcase of scholarship undertaken through the years by students and graduates of the Evolutionary Psychology Lab, which since 2000 has been overseen by Professor Glenn Geher. In that time, the lab has produced dozens of alumni who have gone on to earn graduate degrees and publish their research findings in this fast-growing discipline. The EPIC conference audience, composed of faculty, current students and visitors from local colleges and high schools, got not only a demonstration of the kinds of research being done in contemporary evolutionary psychology, but also a chance to witness first-hand how New Paltz alumni are finding professional success in this field. 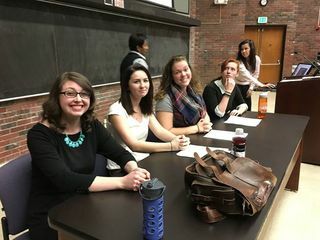 Conference presenters included Rachael Carmen ’09 ‘13g (Psychology), Ben Crosier ‘10g (Psychology), Haley Dillon ‘11g (Psychology), Morgan Gleason ’14g (Psychology), Mandy Guitar ‘13g (Psychology), Laura Johnsen ’12 (Psychology, Theatre Arts) and Nicole Wedberg ‘16g (Psychology). Additional panel discussions were conducted by current students Maureen McCarthy ’15 (Psychology), Selena Perry ’16 (Psychology), Kate Wells ’17 (Psychology – Psychobiology), Kian Betancourt ’16 (Psychology), Matthew Chason ’16 (Psychology – Psychobiology), Richard Holler ’16 (Psychology) and Vania Rolon ’16 (Psychology). Detailed information about the presentations at EPIC, which ranged from considerations of romantic partner insurance to an analysis of competitive beauty pageants, can be accessed online. New Paltz students in attendance also had the opportunity to formally document their experience at the conference via the Co-Curricular Transcript, a valuable resource for those preparing to apply to graduate schools and jobs. For those who may have missed the conference, Keron Lewis, evening supervisor with Instructional Media Services, arranged for EPIC to filmed and streamable online via this link. The EPIC conference was not the first gathering of evolutionary psychology scholars hosted at the College. In 2007, Geher worked with students and faculty at New Paltz and other regional institutions to found the NorthEastern Evolutionary Psychology Society (NEEPS). 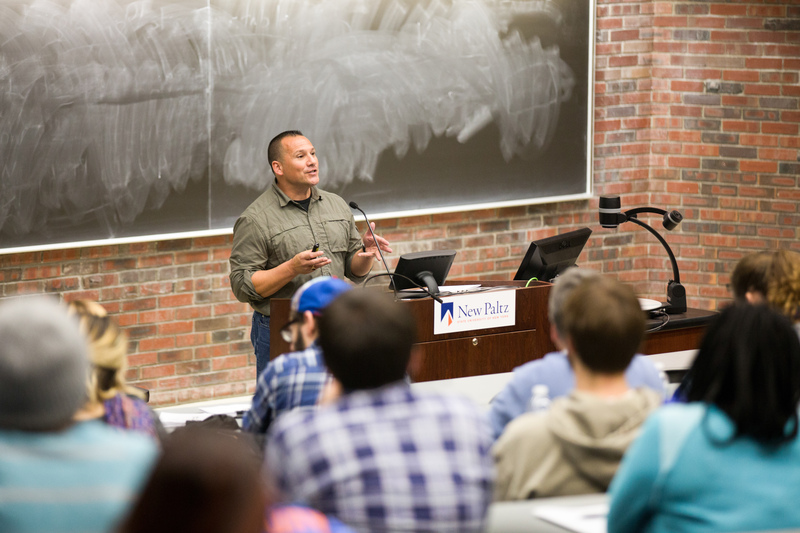 NEEPS has held conferences annually since that year, including at New Paltz in 2007, 2010 and 2014. A blog post written by Geher about the EPIC conference was published and featured as an “essential read” at Psychology Today. That blog can be viewed here. In addition to overseeing the Evolutionary Psychology Lab, Geher is the founding director of the Evolutionary Studies program at SUNY New Paltz, which helps students apply an understanding of the ideas of evolution across a broad array of disciplines.